Precious Pages by Paula: INCY WINCY WEEK TWO! For my second week as Guest Designer for Incy Wincy I was given some digital images by Kenny K to work with and the theme was Girl Power. Although October Breast Cancer Awareness Month is over I decided to go for the Breast Cancer Fighter Gal. 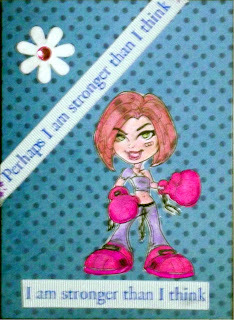 I coupled it with some ribbon I have that reads "Perhaps I am Stronger Than I Think". I put a strip of this diagonally above the image and then the part of the ribbon that reads "I Am Stronger Than I Think'" underneath the image. It was mounted on some coordinating paper, I added a flower and a bit of bling and voila complete! Want to get а Free iPaԁ 3? Diѕcovеr hοw аt http://myiρaԁ3. month and keep it afterwards! Simρly amazing.